I'm sure that every household has at least a few must-haves sitting in their fridge at all times. Among a few other things, in my house, limeade is one of those things. We love lemonade, too—but it's limeade in some form or another that takes the cake. I try to make different forms to liven things up a bit, but for the most part, limeade is limeade. Freshly squeezed lime juice, sweetener, and water. Whether it's a fizzy version like Neebu ka Sharbat (Indian Sparkling Fresh Limeade) or a flat one like Fresh Limeade with Chia Seeds, they all go quickly. This Vietnamese Lime Soda (or Soda Chanh) has sparkles and mint, which makes it extra refreshing. When researching it a little, it seems that some people use mint, some don't...some people rim the glass in salt, some don't. I chose to include both. You know, to add a little variety to our limeade routine. As written, this recipe is particularly tart. We liked it, but if you want it a little sweeter, then simply make (and add) more simple syrup, or stir in some superfine sugar, honey, agave, what-have-you. I enjoyed the salted rim, but the kids said they'd rather have it without. In her book, Steamy Kitchen's Healthy Asian Favorites, Jaden Hair says that Gin makes a nice addition if you want to booze it up (my words, of course). I didn't try it...meant to, but I turned around and it was gone. But I squeezed an extra cup of juice to make another batch. This time, adult-style. 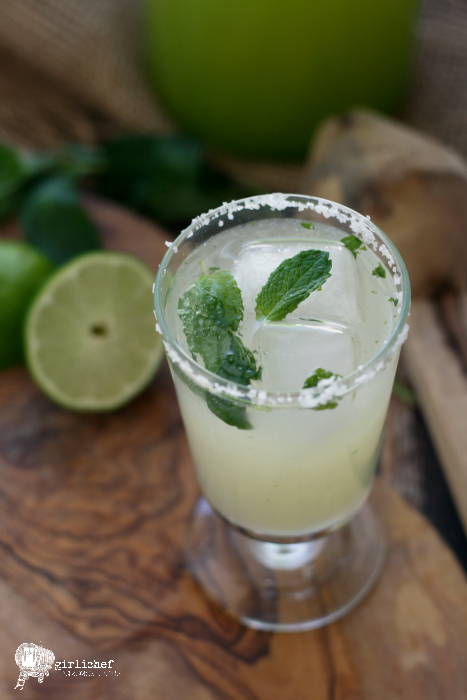 Speaking of adult-style, we might as well go ahead and consider Mojitos a version of boozy limeade, as well. Moral of the story? Limeade is limeade the world round. 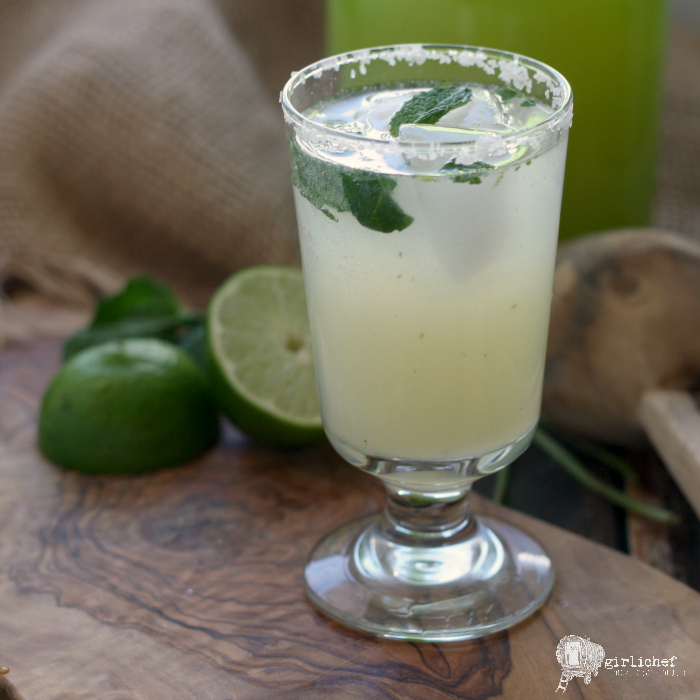 Make refreshing Vietnamese Lime Soda at home with this fresh, easy Soda Chanh recipe. Combine water and sugar in a small pan over medium heat, stirring until the sugar is dissolved. Remove from heat. Muddle the mint leaves in the bottom of a wide-mouthed jar. Pour the hot simple syrup over them and allow to steep for at least 30 minutes. This can be covered and stored in the fridge. 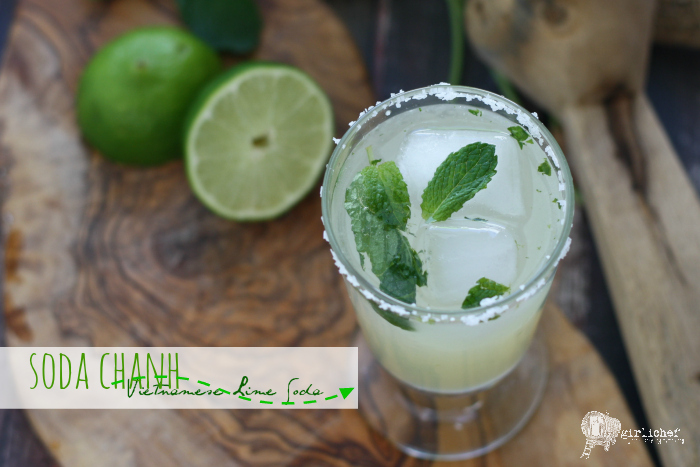 To make the soda chanh, pour the simple syrup into the bottom of a pitcher; add the lime juice. Pour in the club soda (to taste). Serve over ice in glasses rimmed with salt or sugar, if you wish. Welcome to Progressive Eats, our virtual version of a Progressive Dinner Party. This month's theme is Asian Feast and is hosted by Jeanette Chen who blogs at Jeanette’s Healthy Living. Join us and make something unique and delicious!